Illinois bicyclist Jarod Kyle Shumaker of Olive Branch, Illinois was killed Sunday night while on a bike ride on Route 3 in Alexander County. According to news reports, Shumaker was riding his bicycle northbound on Route 3 along the right side of the road when the driver of a Buick Century attempted to pass Shumaker. The driver of the Buick struck Shumaker with the passenger side mirror. This impact caused Shumaker to lose control and end in the path of a following Toyota Corolla that was driven behind the Buick. Shumaker was fatally injured in the collision with the Corolla after the initial collision with the Buick. (625 ILCS 5/11‑703) (from Ch. 95 1/2, par. 11‑703) Sec. 11‑703. Overtaking a vehicle on the left. The following rules govern the overtaking and passing of vehicles proceeding in the same direction, subject to those limitations, exceptions, and special rules otherwise stated in this Chapter:(d) The operator of a motor vehicle overtaking a bicycle or individual proceeding in the same direction on a highway shall leave a safe distance, but not less than 3 feet, when passing the bicycle or individual and shall maintain that distance until safely past the overtaken bicycle or individual. The driver of the Buick was cited by the police for improper overtaking of a bicyclist. There are no other reports of any additional charges at this time. Tragically, the "3-Foot Rule" law exists to attempt to stop this very kind of collision that resulted in the death of Jarod Shumaker. Our thoughts and prayers are with the family and friends of Jarod Shumaker. Below is an infographic from the Illinois bicycle attorneys at Keating Law Offices that outlines Illinois' bicycle law known as the "3-Foot Rule." Keating Law Offices is the premiere personal injury law firm representing victims of bicycle accidents in Illinois. The firm is based in Chicago, Illinois and represents clients throughout Illinois. 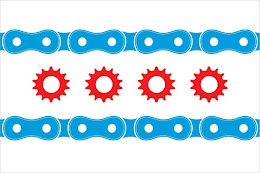 If you have any questions regarding this post or have a question regarding personal injury law, please contact Illinois Bicycle Attorney Mike Keating at 312-208-7702 or Mike@KeatingLegal.com 24 hours a day, 7 days a week. All e-mails and phone calls are returned promptly. All initial consultations are confidential and free.